Flakboy is ready to take a beating again as you explore the various new features, weapons and upgrades, beat Flakboy up in an entirely new way. The fear and loathing for, the squeaky, yellow, toy duck has not yet been overcome by the four eyed, blue alien.Flakboy still, hasn’t learned of the trickery and still turns away from the duck for fearing the uncanny, runs into the traps set up by you. Each of the sequels of game provides extra features and upgrades or bonuses while keeping the similarity between all the other ones. This is the gameplay mode which was initially the only option available in Flakboy which still is available as a gameplay mode in Flakboy 2 and Flakboy 3. The aim of this mode is to reach the amount provided, test your weapons, bludgeon him, throw him, burn him, this is the chance to see what your weapons are capable of, you must hurt Flakboy however you can with the set of weapons provided in order to proceed to the next level. There are around eight levels in the normal mode, each with increasing difficulty as your weapons are tested to their peak. 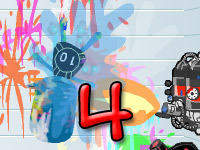 Challenge mode was not available in the first Flakboy game and it was first introduced in Flakboy 2, Flakboy 3 has added more challenges and difficulties in the mode with several new levels to complete. This mode provides you with a great opportunity to familiarize yourself with the wide variety of weapons provided, see what each of the different type of weapons can do, test the force, momentum and power the weapons can provide to successfully guide Flakboy to a position you would want. Sandbox mode was first introduced in Flakboy 2, with the mode being free of interruption you can practice completing the challenges as well. 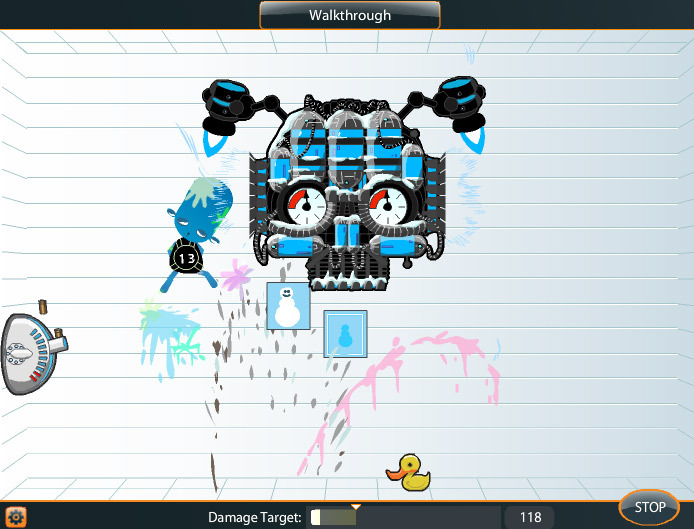 The set of deadly weapons available in the game have increased in number, experiment your weapons on Flakboy, and see if you can finally bring an end to him with these new various upgrades to the deadliness. The primary set of weapon are available in the beginning of the game and you may receive several new upgrades which can only be unlocked if you can use your weapons the right way and proceed to the next levels. 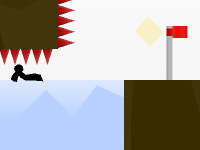 The basic strategy of the game is to use the right kind of weapons, mix up the different type of weapons to produce a perfect combination of brutality. 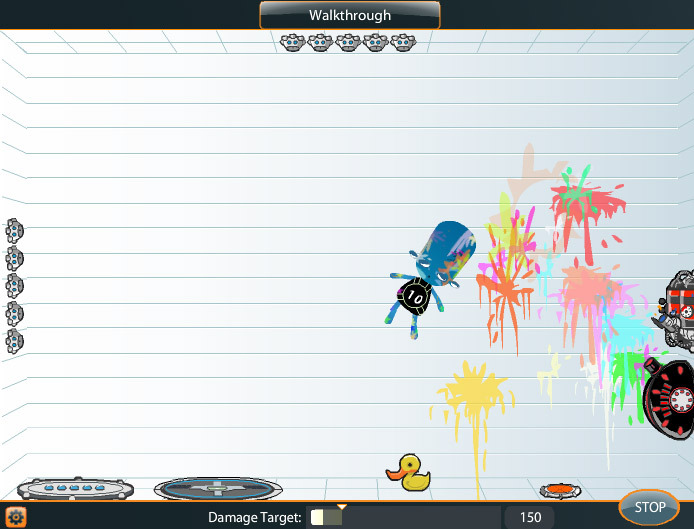 The lethality of the weapon do not have an impact on reaching the most damage, for example, the BouncingBoy 66 may not be lethal as it seems like it only throws Flakboy away but it can be quite lethal if he is thrown in to a set of spikes or in front of a wall gunner. So, the momentum and force of a weapon may prove to be quite useful, in creating a perfect combo for dealing the most damage possible by any weapon by itself. Remember to place the weapons in the correct position in order to get the best effect. 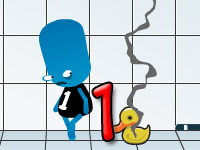 The game only requires a mouse for choosing the weapons and adjusting the weapon’s position. There is a gallery which consist of images and animations, and also an achievement feature which pops up in the game during a special performance.